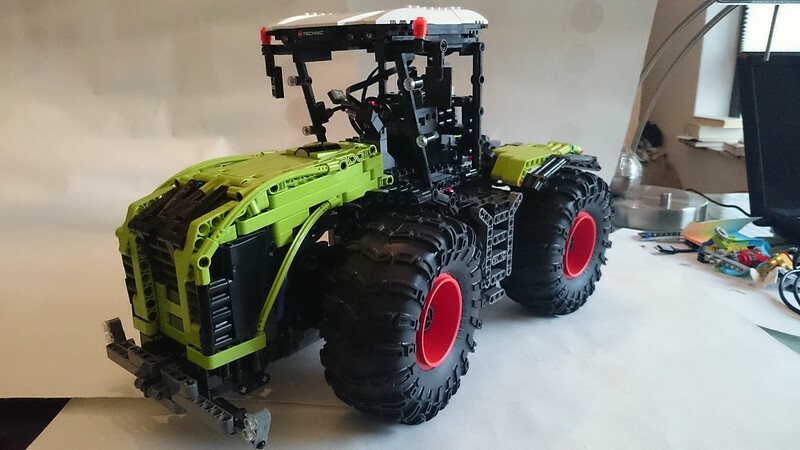 Though it's just a month to go until it's in stores, maybe it's time to start a thread regarding modifications, changes, improvements, etc on the Claas Xerion 500! 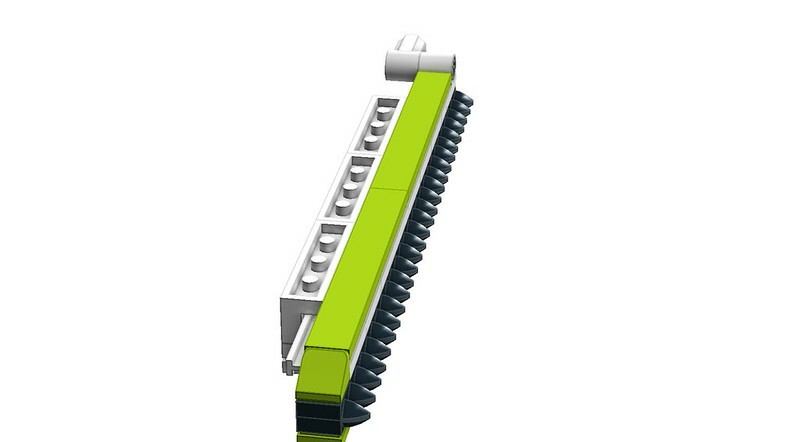 Also, you can post what new attachments/implements that you've thought of and built too! 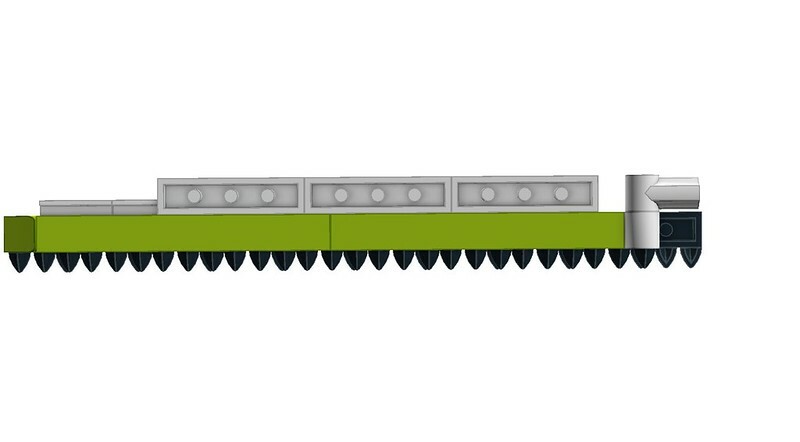 To get things started, I've come up with a nice concept of a Sickle Bar Mower implement that cleverly uses the toothed 1x2 plates! Very Neat - I have a lawn that needs cutting !!! The Claas doesn't have a towbar, does it? Otherwise it could use an huge dragged mowing attachment, with 3 mowers. But if it does lack an towbar: at the rear a static attacment with 2 mowers + at the front an static mower. I like cyclomowers a lot, but a drummower is also very nice. (I dont know if I used the names correct, blame Google Translate. Hope I get the Claas soon, so I can start working on it. 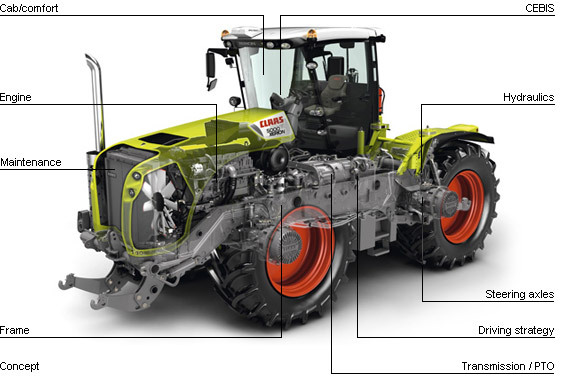 According to Sariel's video review, the Claas does have some sort of '4-point hitch' on both front & rear. But it can have an optional tow bar or small trailer towing adapter if you so desire. 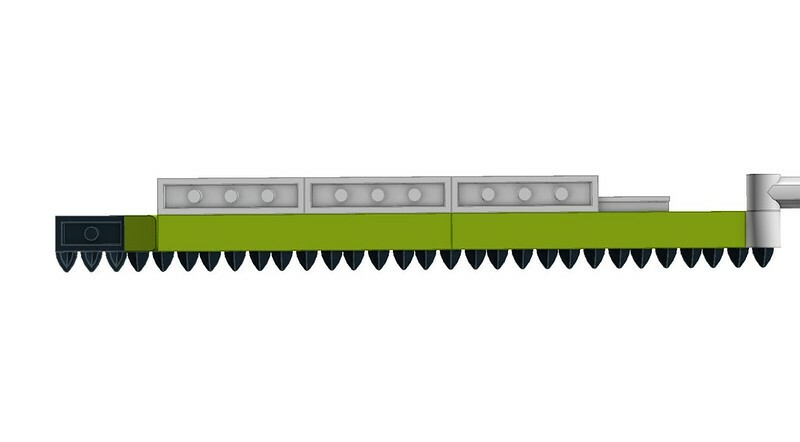 , also, that mowing implements seems really good, i saw something very similar in a video of a unimog u411. Well if it doesn't have a tow bar, make a 3pt hitch with a tow bar, adjustable height control. Good idea! Got a servo under each axis, pretty packed. Thinking of using a small linear cylinder fofor the front hitch...for this I think I do have enough space. 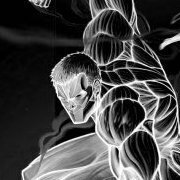 Picture was a bit big for the forum. It isn't a Xerion 5000, it is a 4000, but anyone willing to try this? , way out of my building experience but would be cool to see.
. The snow blower would be a nice addition. 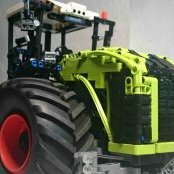 @JBTechnic: I think I saw your Xerion on YouTube some time ago and I must say that I like it very much. The looks and the shape of your version are excellent and the turning cab is very well implemented! I am curious: How did you realise the steering? Using two servos? Has your Xerion AWD? I used two servos for steering and two Xl motors for driving. I planed to use a similar concept like on the 4x4 offroader with a servo and an extra motor to select the drive mode. I thought that if I have to use 2 motors anyway I'd go with two servos. So I got 2- and 4 wheel steering as well as the crab walk. For driving I have choosen 2 XL motors since I need enough power for trailers and/or other aux. I put 2 L motors on each side for lifting and turning the cabin, driving the compressor for the pneumatic functions. And I got a drive shaft to drive functions on trailers. I used the battery pack from the Lego train and put it under the hood up front. That way I could keep the hood slim compared to the TLG one. Potato harvesters are cool and we don't see them around here much. I have considered such a contraption as well. Would love to see that, but make instructions for it please, not a MOC builder, more a collector and rebuilder, so need instructions. 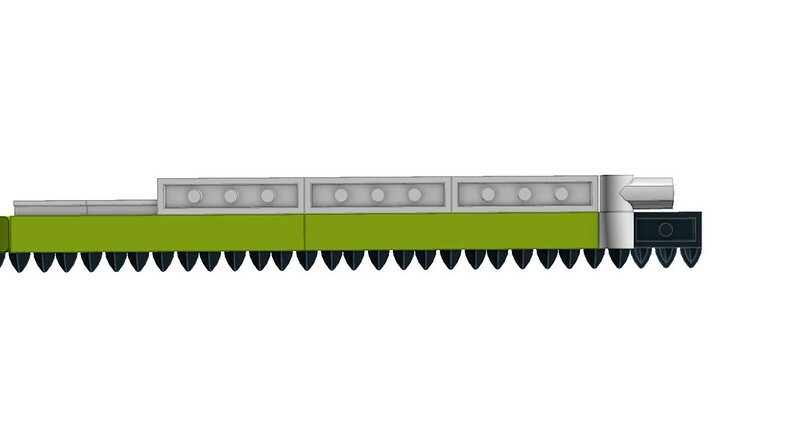 It looks really cool, like some kind of vehicle from Mad Max, it would be amazing to see it built in Lego. a total beast!...you would need two sets though to get the 8 wheels. 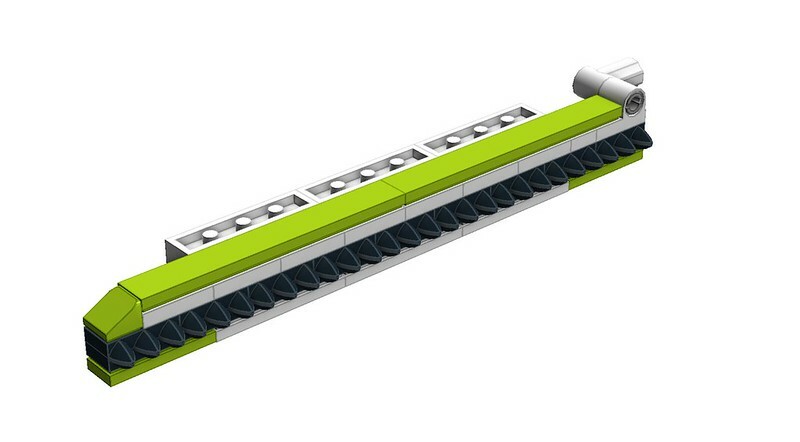 I am thinking that it would be a good idea to add pneumatics to the tractor, not to lift the hitching point, but to control the functions in the implements, i am not sure if there is even space for it, i hope to get the instructions for this set soon to see what can i do. I installed an air tank underneath and a pump for the supply at the front. That way I have air for the hitch and 2 air circuits for functions on trailers. If link doesn't work, search for lego xerion JBTechnic on Flickr. 2 sets are insta buy 1 august. May be 3d later with some good discount . Gem set.